It is my favorite time of year: strawberry season! Strawberry season has officially started here in Michigan and I couldn’t be more excited. I look forward to strawberry season every year. As soon as my favorite strawberry farm opens up their fields for picking, I am on my way there. I usually freeze most of the strawberries that I pick. I love using this method to freeze the strawberries. It is the perfect way to preserve the berries all year round. This year I decided to make a chia seed jam with some of the berries that I picked. Traditional jam isn’t my favorite thing to make. I will admit that I am not an expert at canning. This is why I love making jam with chia seeds. It takes less than 25 minutes and you don’t need that much sugar! 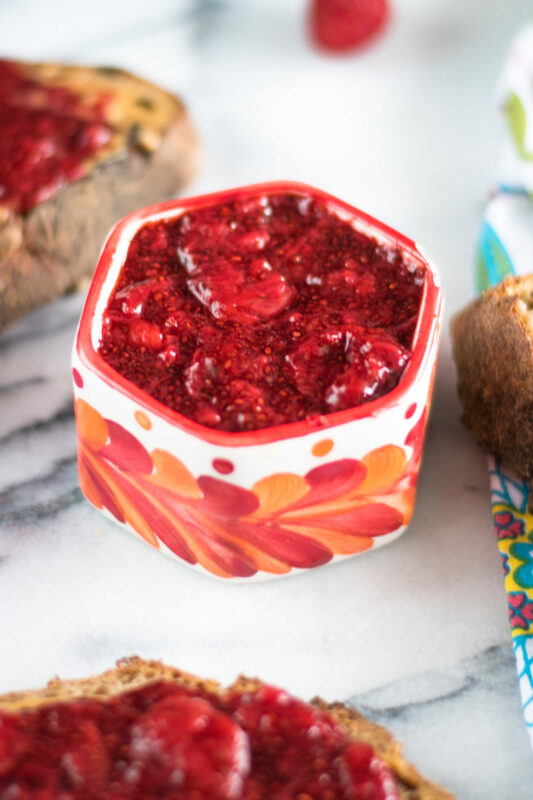 For this Strawberry Vanilla Chia Jam, I use just a touch of pure maple syrup to sweetened up the jam. My strawberries from the berry farm were on the small side, so I left them whole. If your berries are on the larger side, I recommend halving them. I love adding a tiny bit of pure vanilla extract at the end. 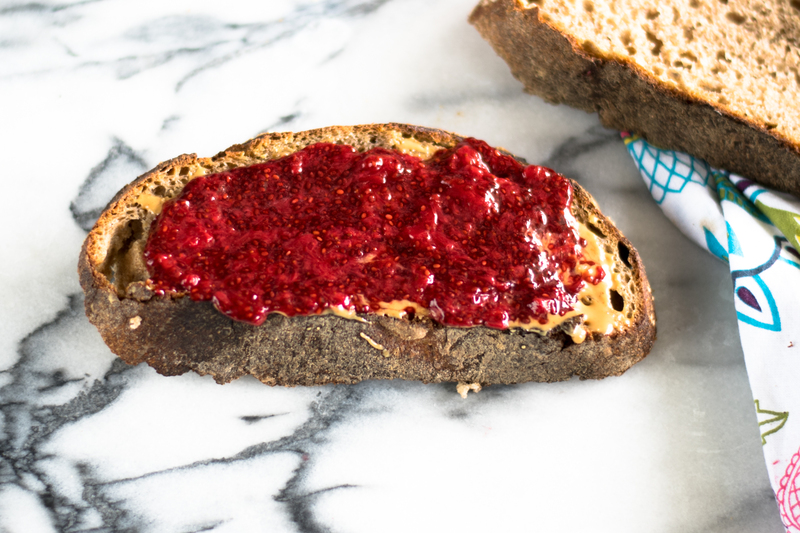 It just adds a nice sweetness to the chia jam. 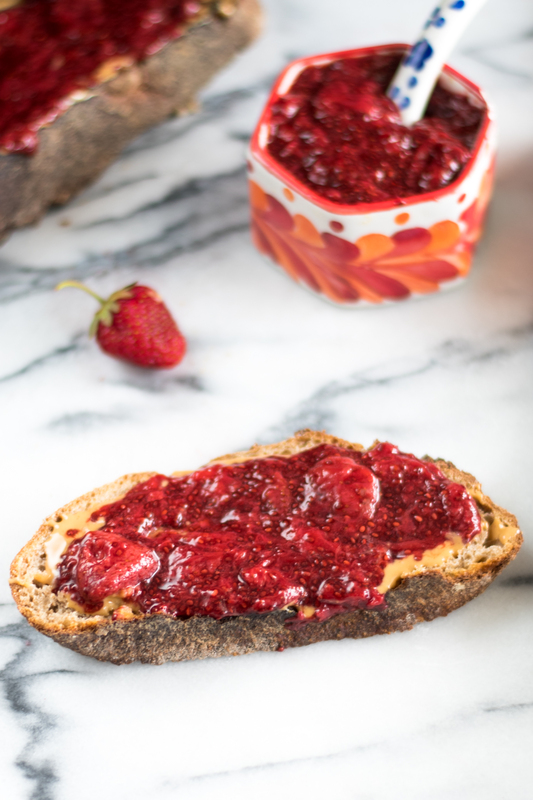 I have been loving spreading this Strawberry Vanilla Chia Jam on whole wheat bread with a little bit of peanut butter. So good! Perfect for breakfast, lunch or an afternoon snack. 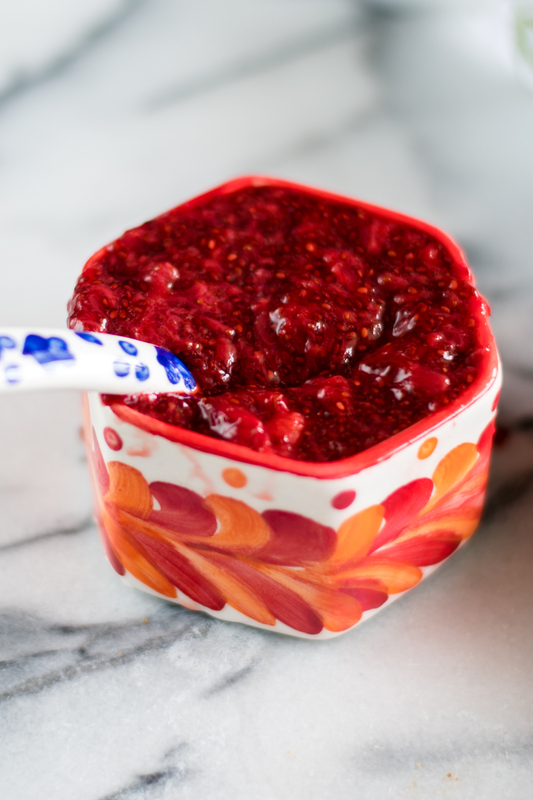 A quick and easy strawberry jam made with chia seeds! Heat a medium pot over medium low heat and add the strawberries and maple syrup. Cover and cook for 5 minutes; occasionally stir. The strawberries will start to break down. Use a potato masher or the back of a fork to mash the berries. I like to leave some of the strawberries a little chunky. Add the chia seeds and stir. Reduce heat to low and cook 15-20 minutes, stirring often. Once the chia jam has thickened up, turn off the heat. Add the vanilla extract. Transfer the jam to an air tight container and store in the fridge. The jam will continue to thicken as it cools. If your strawberries are on the larger side, I recommend halving them.